Google’s Penguin algorithm now runs in real-time, meaning your website can be penalised any time for having backlinks that are in breach of quality guidelines. If quality sites link to you then, in the eyes of Google, your site deserves to be seen. But low-quality ‘toxic’ links can land your site with a penalty and drag your rankings down. We use a range of best-practice techniques to build backlinks that boost rankings, whilst tracking down and tackling bad links that do more harm than good. Our team of SEO specialists stay up-to-date on all Penguin updates and are skilled in identifying and rectifying non-compliant practices. A Google penalty can lead to lost rankings, lost traffic and lost revenue. However, with the right SEO practices in place, your website can climb up the rankings again. As your SEO agency, we can help you revive your website business and defend it against further Google penalties. It is important to regularly audit your link profile and we recommend you do this every 3-6 months. This will help you to keep your backlink profile inline with quality guidelines. 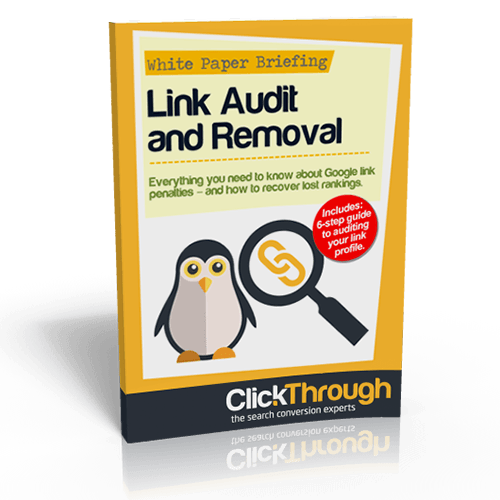 Our link audit process will identify penalties, classify your links as ‘compliant’ or ‘non-compliant’, contact webmasters to ask for bad backlinks to be removed, and add non-compliant links to a disavow list. For more on this process read our 6-Step Guide to Auditing Your Link Profile. Confident you can lead your online reputation management going forward? Then our backlink audit is a great starting point. Our SEO experts will check backlinks to your site and create a backlink audit data report. This will enable you to analyse and work through your backlink profile in your own time and disavow relevant links within the Google Search Console.